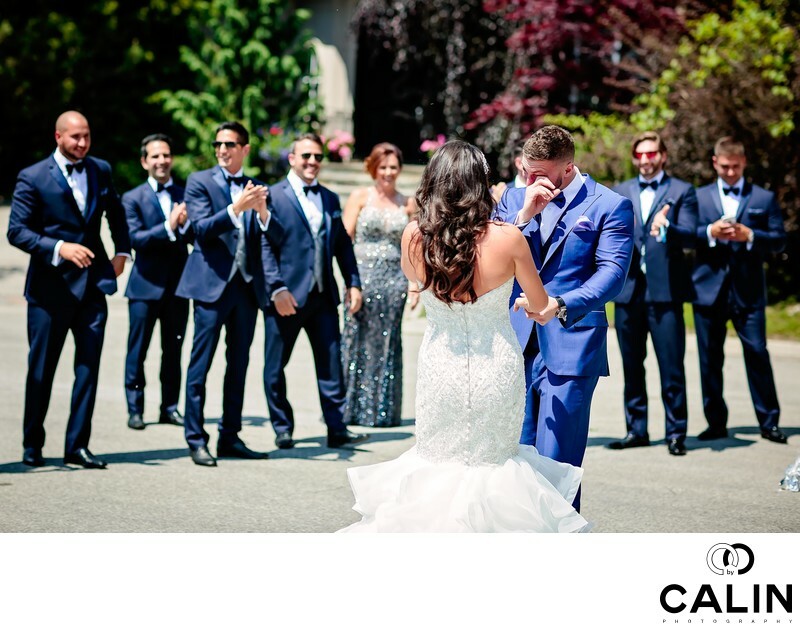 As wedding photographer, I love emotional couples in during this special day at Château Le Parc I had plenty of opportunities to capture genuine expressions of happiness that only a wedding day can offer. In this picture, taken before the wedding ceremony I captured the moments when the groom, overwhelmed with emotion, was wiping off a tear. The bride and groom are placed in the foreground in this picture given it a 3 dimensional feel. In the background, we see the bridal party and the groom's parents applauding, obviously enjoying the moment. I to this picture sometime around noon on a sunny summer day when the sun was right about our heads. From a technical standpoint it is not perfect but this wedding album spread is very important for the couple as the photograph was taken minutes after the first look. They say a picture is worth 1000 words? That is a massive understatement! Here, the bride is holding the groom's hand, he's wiping off his tear and his friends, family and guests are behind them applauding. That, in essence tells the story of the whole wedding day in one photograph. This candid image meant so much for the newlyweds couple that they chose to included as a double page album spread.